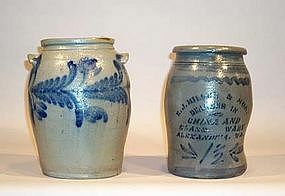 Alexandria, VA had a thriving salt-glazed stoneware industry throughout most of the 19th Century. Many pieces are marked with the makers name and "ALEXa" or "DC/ALEXa". Some common makers were John Swann, B.C. Milburne, H.C. Smith and E.J.Miller (a retailer). We are always interested in purchasing examples of Alexandria stoneware. If you have something you would like to sell, please send us a photo including the makers mark, size, condition and the price (we do not make offers). Paper size: 8" x 5.5"
Oil on canvas, retaining a partial exhibition label with title, artist and the address: “311 Fenway Studios - Boston”. Also maintaining a partial "Paris" label on the stretcher. This item has been sold. It remains on our website for internet research purposes. Zouave soldiers were known for their flamboyant uniforms which included short open front jackets with a waistcoat, baggy trousers and braiding embroidered on pantaloons and jackets. Often worn with a fez although this soldier is wearing a forage cap. This item has been sold. It remains on our website for people doing internet research. Fine antique English traveling desk in coromandel with brass straps and carrying handles; the fall front transforms into a double hinged writing surface with spring loaded pen and ink drawer behind; the slightly domed top opens to reveal a fitted oak interior of letter racks and three small drawers. Circa 1860-1880. 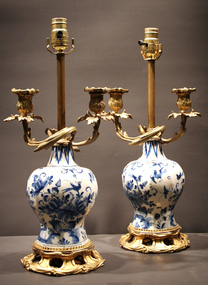 Exceptional pair of 18th century delft vases fitted as bouillote lamps and now wired for electricity with ormolu mounts; having octagonal baluster form bodies with bird and floral decoration and scrolling candle arms. Probably French, Circa 1760-80. Fontarrabie is the French name for the Spanish town of Hondarribia. a coastal town in Basque country Spain, on the French border. Oil on canvas, signed lower right. Leendert de Vogel was born in Sommelsdijk and resided in Barendrecht, Holland. Vogel took up painting in his 40’s after a career as an industrial designer. He rendered traditional subjects (Street Scenes, Churches, etc) in a mid 20th century impressionist style. Oil on canvas, signed lower left. A painter and illustrator, Nichols was born in Washington, DC. His father was a prominent wood engraver during the Civil War. His brother, Spencer, and his wife, Wihelmina were both painters. 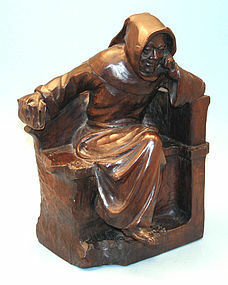 Antique Carved Oak Statue of a Monk holding a book and seated on a curved bench. Probably American, circa 1880. A wonderful example of an Arts & Crafts hammered copper drinks set with riveted brass banding and brass handles, comprised of a 16” tray, a pitcher and six mugs. Circa 1890. 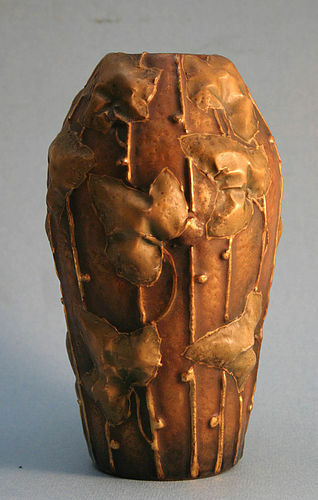 Art Nouveau Vase by the Amphora Pottery, Turn Teplitz, Austria, decorated with moulded leaves with gilt stems, stamped base. Circa 1905-10, attributed to Paul Daschel. Oil on artist board, signed lower right. Born in Pavia, just south of Milan, Sollazzi, studied with Romeo Borgognoni (1875-1944), attending Milan’s Academia di Brera. His work has been immensely popular throughout Italy and Europe with his focus on subjects of scenes of small villages in Greece, Italy and the North African Coast in particular.